There are a number of opportunities to meet together both formally and informally during the week... many of which help us get to know one another and to get to know God better. Meetings start with a short service, which is then sometimes followed by a talk on an interesting topic. There is always an opportunity for some tea and chat! Visitors welcome! For more information, contact us. An informal place of support, prayer and a chance to read and discuss the Bible together in someone's home. For more information, contact us. Come and explore life and faith every Wednesday morning during term time. If you're interested in exploring spirituality and faith together through discussion, conversation and croissants this is the place for you! So far, we have been discussed topics such 'God in the Busyness of life', 'God in the Everyday' and 'Families and Faith'. There is a creche for young ones. We start at 9:30am with a light breakfast followed by a discussion, a time for silent reflection in the church for all who wish to join, then time for chat and coffee. We finish by 11:30. Contact us if you are interested in finding out more. An informal gathering of 'music-minded' people who gather together to sing and play together. All welcome! 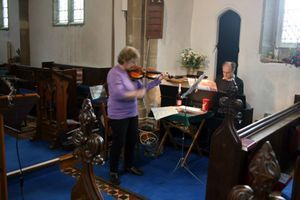 There is always time for a cup of tea and a chat after the music-making. 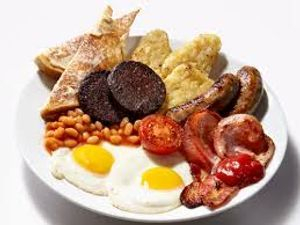 The men of the parish and adjoining parishes meet for a cooked full breakfast of porridge, cereals, fruit juice, bacon, eggs, black pudding, baked beans, toast, tea & coffee and a good chat in a relaxed, cordial atmosphere. There is sometimes an opportunity to hear from a speaker on what we hope will be an interesting topic! Feel free to stay for the whole session or leave when you prefer!